Congratulations—you’re engaged! Aside from the excitement of hunting down your dream dress for the big day, you also have the rare opportunity to upgrade some of your everyday household staples to match your stylish wardrobe. Now, creating the perfect registry might seem like an overwhelming task, but it’s actually one of the most fun wedding-related activities you and your S.O. can do together (right up there with cake tasting!). Like to cook? Great. Love to entertain? Even better. Macy’s makes it easy to nail down the items you didn’t know you needed (or wanted). From cookware sets to coffeemakers, these nine kitchen items will make mealtime so much more enjoyable. One thing fashion girls know to be true: No matter how much space you have, storage always seems to be an issue. (Have you seen my closet?) 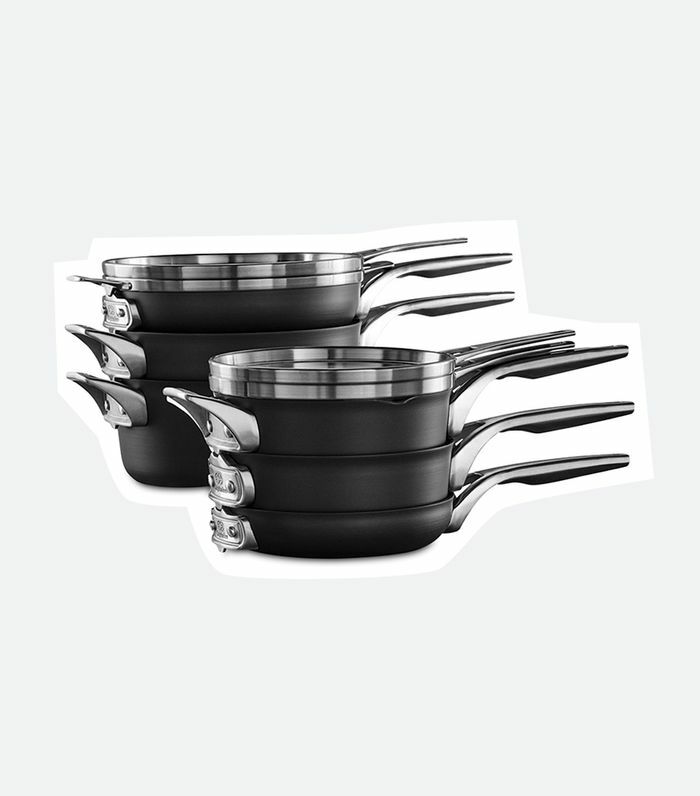 But that’s not the case with this stackable cooking set. It saves 30% more space than a traditional stacked set, making it the perfect excuse to add more to your registry. This 10-piece bakeware set is a best seller for a reason: It comes with all the essentials needed to bake-proof your kitchen, and everything is non-stick, which makes cleanup less intimidating (important when you’re wearing that new white silk blouse). Sometimes you don’t realize you need certain kitchen tools until you’re actually cooking, which is super inconvenient to say the least. Add this to your registry (and maybe pick up these jeans while you’re at it) and you’ll be set with 15 must-haves. Our obsession with avocados isn’t going anywhere, and we bet the same is true for you. This handy little tool makes it easy to cut, slice, and remove the pit. We predict a lot of avocado toast in your future (that you’ll obviously have to share on social). No matter how many people you’re serving, slicing fruits and veggies is exhausting and can get messy (we have many stained tees for proof). That’s why you need a mandoline. Not only does it come with multiple blades for variety, but there are different settings depending on the thickness you want. Oh, and it’s collapsible and comes apart for easy cleaning and storage. When registering for place settings, you want to pick something classic, special, and durable (just like when you go shopping for clothes). This four-piece set checks all of those boxes. The ribbed texture gives it a traditional feel, while the fresh color makes it modern and fun—perfect for newlyweds. The best part, though, is that these aren’t just nice to look at—they’re durable, can be used in the microwave and oven, and can be cleaned in the dishwasher. This is the same set as listed above, but if you can’t decide on a color, why not register for two? Think about it: You probably have the same pair of jeans in different washes in your closet, so why not do the same for your wedding plates? It’ll make your dinner parties that much more memorable. Consider this your new best friend—especially on days (or weeks) when you’re very, very (very) busy. Basically, you throw in all the ingredients, put the settings on, and let your food cook. You’ll come back to a flavorful, juicy dinner. We have to note that this pressure cooker isn’t your standard machine: It’s also an air fryer, meaning you can fry your food (with up to 75% less fat than other frying methods) without giving up on your wellness goals.